Bagan Thiripyistaya Sanctuary Resort is situated on the banks of the Irrawaddy, Myanmar's river of history and legend. The Resort sprawls over 24 acres of landscaped gardens, which is home to mature tropical trees and flowering plants, as well as native birds and a number of small tame animals. Every morning our gorgeous peacocks, Myanmar's national bird, go for a walk in our garden. Oriented towards the west, the Resort revels in panoramic river views, glorious sunsets and silver moonglow, and a pervading atmosphere of profound peace, warmth and comfort. The Bagan Kingdom, according to tradition, was ruled by a long line of fifty-five kings until the 13th century AD. However authentic history of the dynasty supported by epigraphic evidence begins only with the reign of Anawrahta (1044-77 AD) who in 1057 brought from Thaton the Theravada scriptures in Pali, as well as a large number of Buddhist monks, artists and craftsmen. From this date onwards, there began extraordinary architectural and artistic activity that saw the building of thousands of splendid monuments, temples and pagodas all across the kingdom. At the end of the 13th century, the Bagan dynasty fell to Chinese invaders. 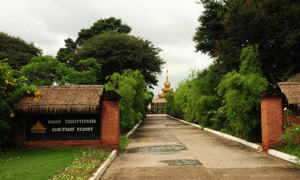 Bagan Thiripyitsaya Sanctuary Resort was established 30 years ago as the Government’s guesthouse for elite visitors. In 1996, it was taken over by Japanese investors and managers and has since then undergone extensive renovation, upgrading and expansion. The Resort has been host to international political and business leaders and celebrities, and is considered to be Bagan’s foremost hotel. 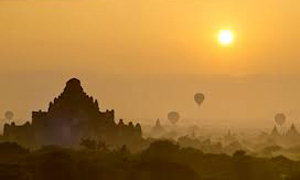 Located in central Myanmar, Bagan is 400 miles north of the former capital Yangon. Aside from the Myanmar language, English is spoken at hotels and other tourist spots. All visitors arriving in Bagan are required to pay the Kyats 25,000 as Bagan Archeological Zone Entrance Fee. Local currency is the Kyat. United States Dollars (US$) is accepted at hotels. VISA, Master and JCB Cards are accepted at some hotels. Boutique The Thiripyitsaya in the Resort features a selection of gems and the finest Myanmar arts and crafts. In The Thiripyitsaya, Myanmar silver, carved jade, Bagan lacquerware and other handicraft, Mandalay silk, as well as practical items such as cotton clothing, film, sunblock, sandals and rubber thongs are available. The Nyaung Oo Market and other shops are usually open for business from 7AM to 4PM everyday except on Full Moon day of each month. Lightweight summer clothing is sufficient throughout the year. Bagan has low rainfall even during the height of the monsoon season (April to September), so you can enjoy sightseeing there throughout most of the year without being affected by the weather. Average temperature during the summer months (April to September) is around 32 degrees, and around 28 degrees the rest of the year. Visitors are advised to drink only bottled or boiled water. Bottled drinking water is available in the guest rooms, compliments of Thiripyitsaya.